Fall has slowly made its way here. It was 80 degrees last week and it hit the low 40's over the weekend. I like this time of year when the leaves are changing colors and the air is more crisp and not so hot. I don't mind being outside because I know I won't break a sweat. I'm more of an AC girl in the summer. Fall is one of those seasons I don't really decorate for. I like to keep things simple around here and don't want to make a big fuss re-arranging things. I wanted to dress the table up nice and simple and use what I already had. I pulled out my centerpiece from last year and the white and blue pumpkins. The pumpkins give me more color. I mixed in some glass candle votives, a grapevine pumpkin, and a metal orb from Target. I wanted to bring in natural elements. The colors are neutral. I'm not big on the traditional oranges and reds for fall. I love the natural look on the table. What are you decorating with for fall? 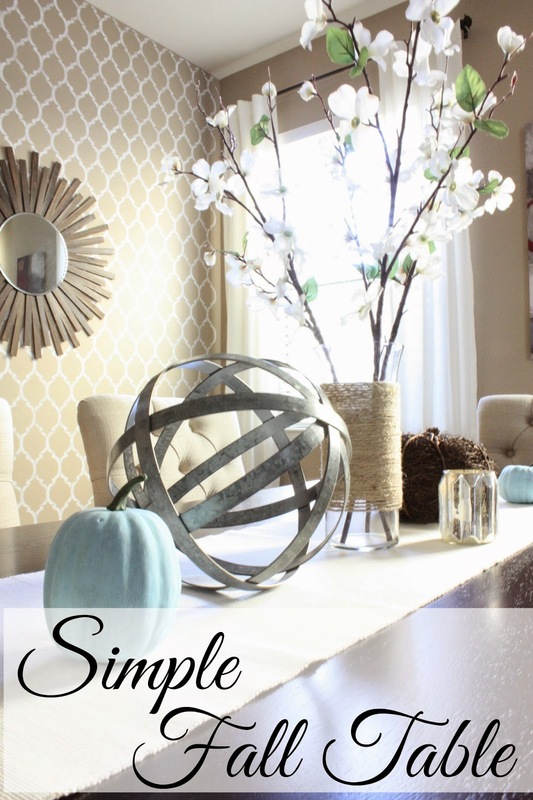 You're reading Simple Fall Table by Andrea, originally posted on Decorating Cents. 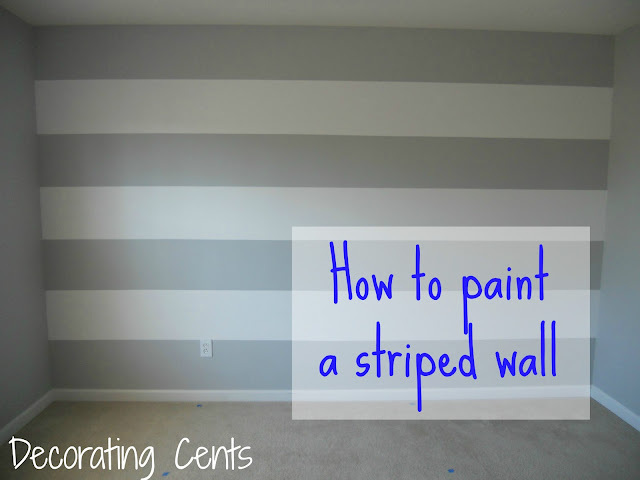 If you've enjoyed this post, be sure to follow Andrea on Facebook, Pinterest, Bloglovin, and Hometalk. Your table does look beautiful - I am kinda the same way about traditional fall colors so I really dig the blue & white pumpkins!! The extent of my fall decorating inludes a wreath and the cinnamon scented cones. This year I may just wrap one of my glass vases for the cones! great ideas. What a beautiful room! I love the light blue pumpkins! This is so pretty!! I love how you kept the fall items in your color scheme, you do not see that often, glad I found you today on the HW Link Up ! I will be sure to follow you! That is so elegant. 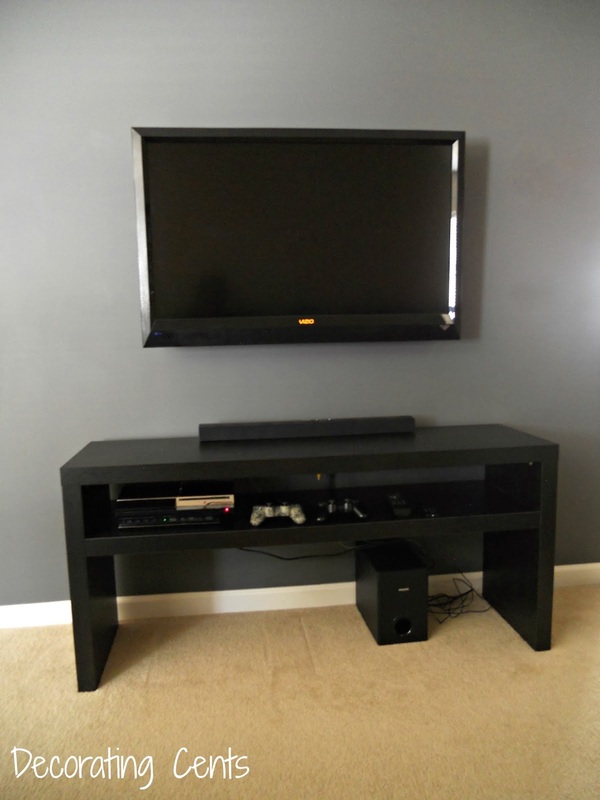 It really fits right in with the style of your room. What an inspiration. Thank you so much for sharing that with us. I love how simple and yet elegant this is! makes it easy to get ideas from to recreate on my own table. Simple beautiful elegance. Love absolutely everything about your table. That metal orb from Target is awesome. Now I have yet another excuse to go to Target, haha. This is so gorgeous, Andrea!! Wow! Thanks so much for linking up with us :) Hope to see you back next week.... Look forward to looking around your blog! Looks lovely and gentle! I really enjoy the project! I like the neutral fall look you have! I'm with you on the fall decorating.. I don't tend to do the orange and reds. So pretty and sophisticated looking! I love the blue pumpkins!! I would love if you would stop by and share this post at my blog party, Celebrate It! It’s all about celebrating the everyday things we do!